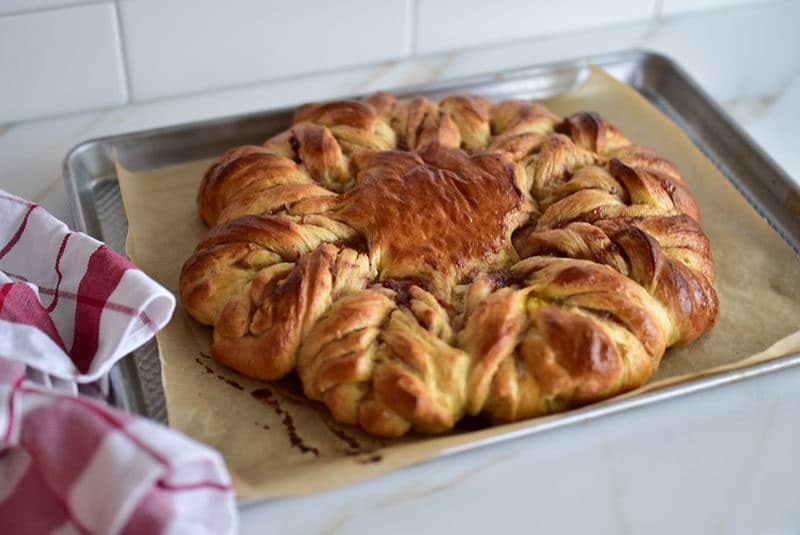 This gorgeous brioche star with strawberry rose jam is scented with orange zest. A beautiful and delicious way to wake up on a holiday morning. Make the dough for the brioche star up to two days before you want to shape and bake the bread, keeping it chilled in the refrigerator. Also see my Christmas Breakfast Wreath. There were many, many recipes that were, in a word, demystified for me during culinary school. First and foremost: the mother sauces. Then, butchery, and the making of smoked and cured meats. A fascination (I was, I boast, the first to step up to saw off the hoof of a 300 pound pig on the butcher block). Wine tastings opened my eyes and palate during our weekly regional wine lessons and trips to Napa and Sonoma (I know; it was tough). But the days that struck my sweet spot, my soul food, were the baking days. We learned breads of every sort, including during the holidays when we delved into traditional enriched holiday breads. Magically, that week of the buttery breads was winter-like in San Francisco, and the gray haze outside the front wall of windows emphasized the yellow light and steam inside our little school. We baked panettone and stollen, challah and Mexican Three Kings bread. These were delights I had always put in the “bakery” category of my mind rather than the “we make these” category. I fell in love, amid all of that love, with the challah braiding, and also with the brioche rolls, as much for the dough itself as for its resulting breads. Buttery, airy, soft like a baby’s bottom . . . this is the kind of dough that bread-baking fanatics dream about. Whenever I see a braided bread recipe, I go back to my culinary school happy place, and I want (no, need) to get after it. 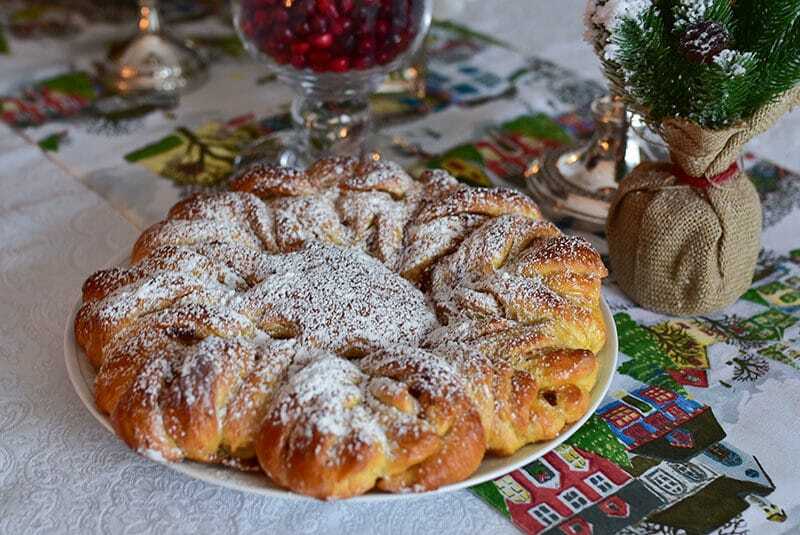 This version, a Christmas breakfast wreath which is a stunner of a twisted bread filled with almonds and rosy dried tart cherries, tops my baking list right about now, the week or so before Christmas. If I could I would clear the decks and bake these breads all day, the aroma of yeasty dough wafting through the whole house. 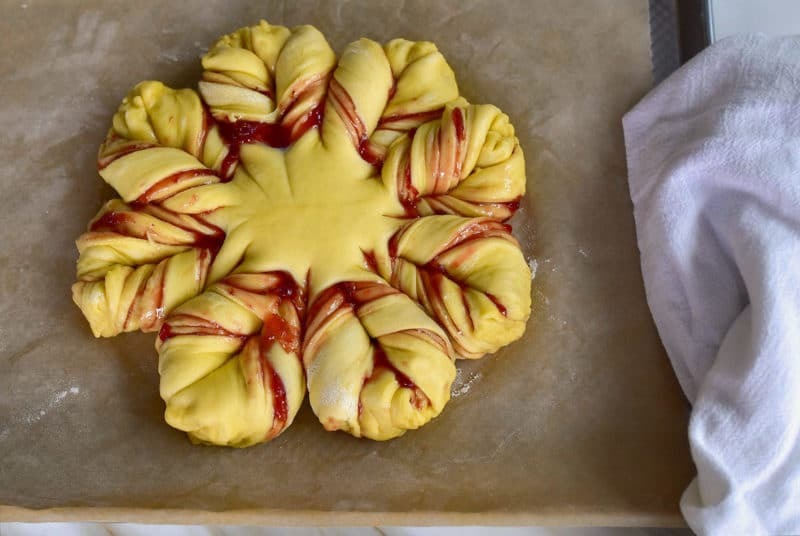 Last year I came across another gorgeous twisted bread that forms the shape of a star, or a flower, depending on your view. It uses a brioche dough fragrant with orange zest. 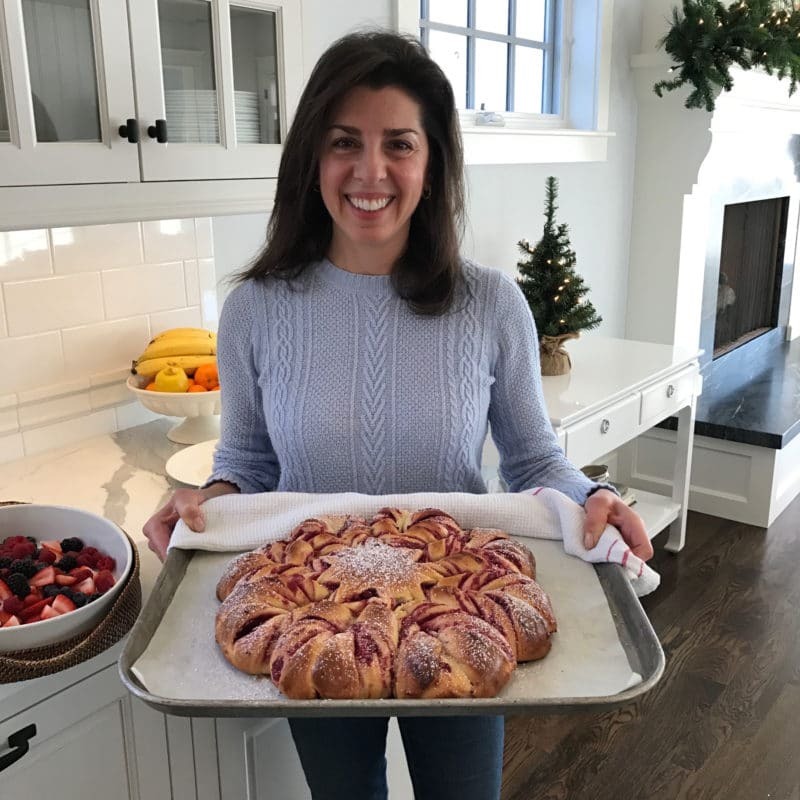 The dough is rolled in circles and layered with a filling that begs practically out loud for Lebanese strawberry rose preserves. I’ve baked the bread both with and without the orange zest, and I promise you it’s a keeper. One orange is all that is needed to layer even more flavor into the buttery beauty. I love how the fragrant orange reminds me of a cinnamon roll my mother used to make with orange zest and coconut. What I’d give to find that recipe again. I’ve scoured her recipe file and it’s nowhere. I’ve scoured the internet too. Nothing. I’ve also of course scoured Mom’s mental recipe file, and she says she remembers it but she does not think it included orange zest (yes it did). If you recall these rolls from the late 70’s/80’s and can demystify them with a recipe to share with me, I will send you a prize (dead serious). It’s a total pleasure to serve the beautiful brioche star for a holiday breakfast when your people are gathered. The dough is made in advance by a day, then you can get up early to go the distance (it takes a couple of hours but not all active time; the roll has to rise a second time after it’s shaped). 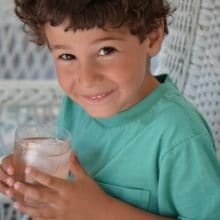 The first time I made it, I stood at the counter on New Year’s last year and the yeasty warmth of the kitchen gave me good, solid time to reflect on gifts of the year past and hopes for the one ahead. It all felt pretty mystical. This isn’t just gorgeous holiday bread at its finest; it’s spiritual bread! So much for demystifying anything. A little mystical mystery is a lot magical. 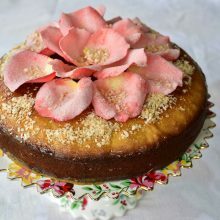 This recipe was inspired by this beauty at PBS (the video there is divine). There the filling is a homemade cranberry jam, which I’ve also tried and which is delightful especially with a few drops of rose water. 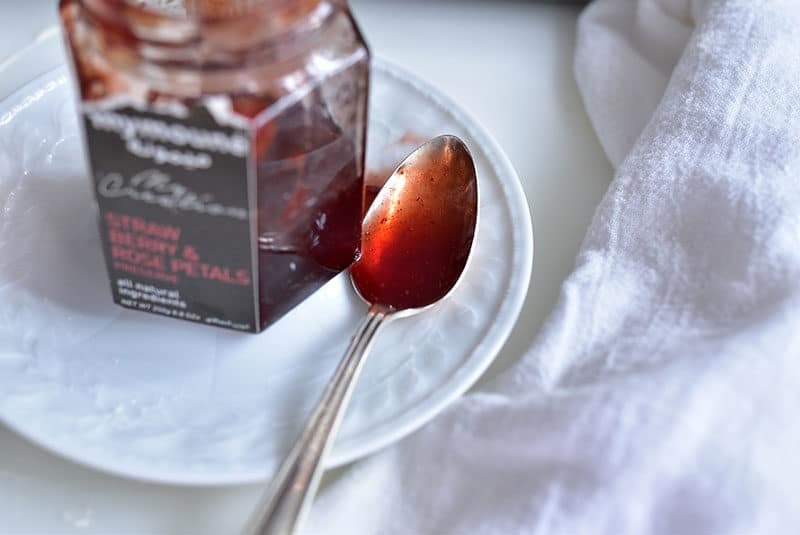 I love to use strawberry rose preserves or any favorite preserve. I always add lemon juice to my preserves, for added tartness to balance the sweet. 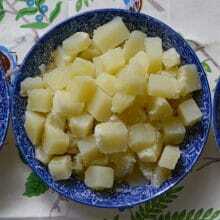 In a small bowl, combine the yeast and the milk along with a tablespoon of the sugar. Set aside until frothy and activated. In the bowl of a stand mixer, add the sugar, eggs, flour, salt, and activated yeast mixture. Using the dough hook attachment, knead on low speed for about 2 minutes or until the dough comes together and forms a ball. Increase the speed to medium and slowly add the softened butter, 1 tablespoon at a time, allowing the butter to incorporate before adding the next tablespoon. Continue beating the dough until it is smooth and supple, about 8 minutes longer. Remove the bowl from the mixer and cover with plastic wrap and a towel. Leave the dough to rise for 90 minutes. Refrigerate the dough overnight or up to 2 days. 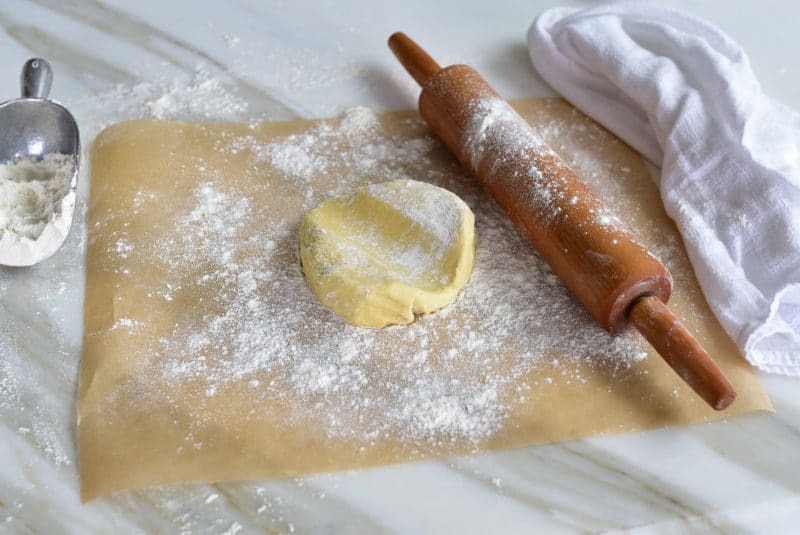 The dough must be very cold when you work with it, so remove it from the refrigerator when you are ready to shape it, and not before then. Work quickly throughout this process so that the dough does not warm up and soften too much. If it does, simply chill it again for 20 minutes. 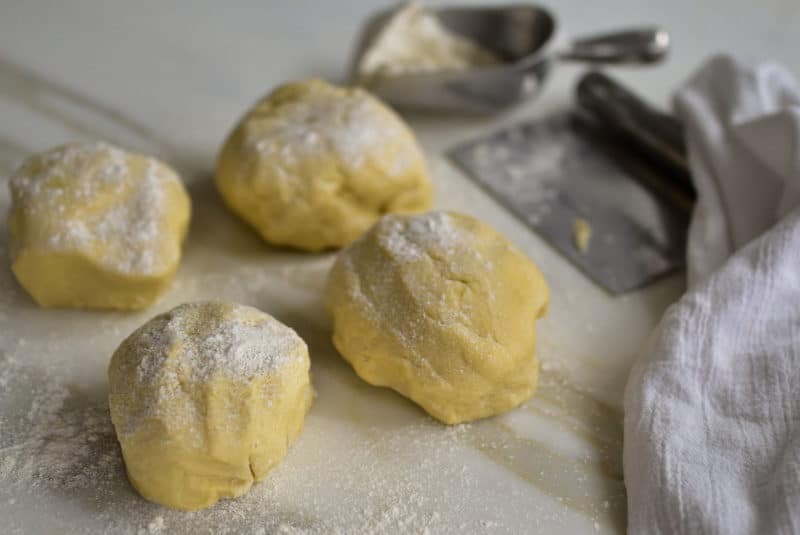 Cut the dough into 4 equal pieces and shape them roughly into balls. Lightly flour a sheet of parchment paper and roll one ball into a 10-inch circle, about 1/4-inch thick. Trim the edge using a cake pan as a guide (setting aside the scraps which can then be made into a small loaf and baked after rising). In a small bowl, stir the preserves with the lemon juice. 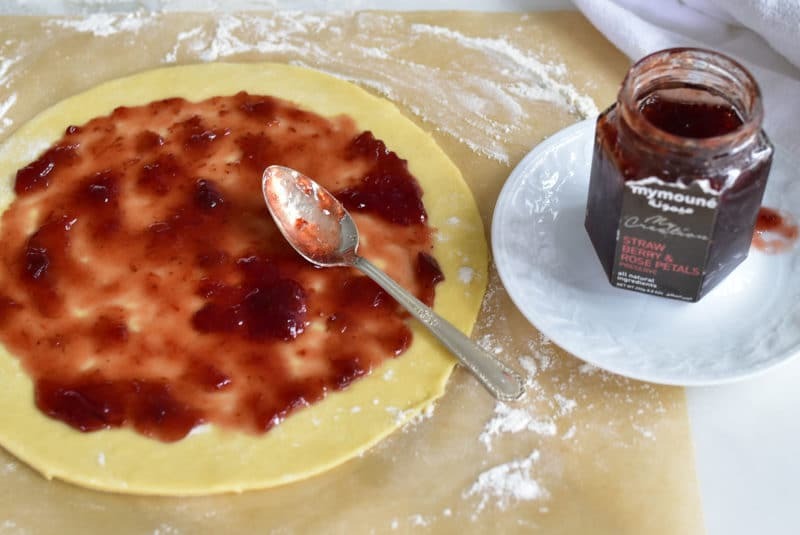 Spread approximately 1/4 cup of strawberry rose jam evenly on top of the dough, leaving an inch around the edge dry, without jam. 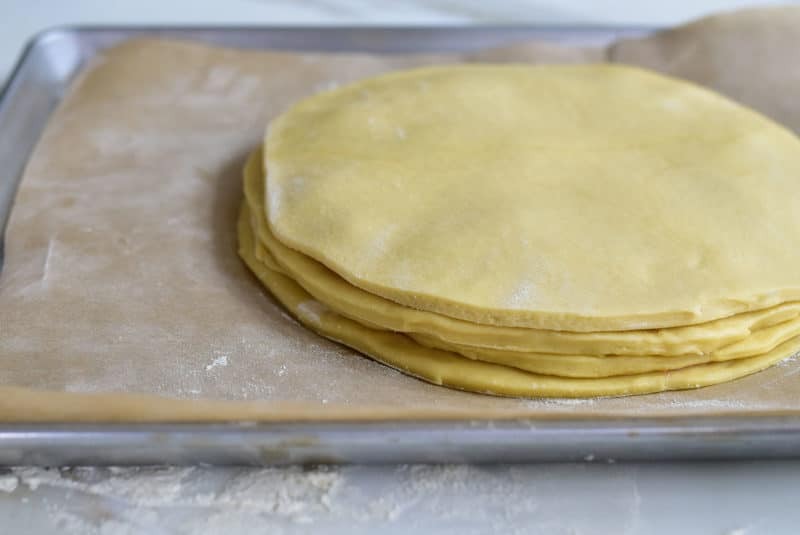 Move the parchment with the dough on it to a sheet pan. 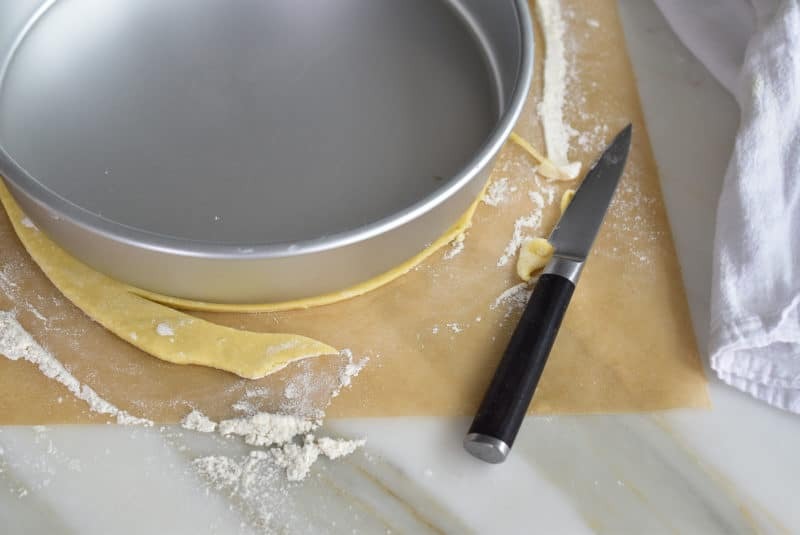 Roll out the second ball of dough on a lightly floured work surfac, trimming it to a 10-inch circle and adding the scraps together. 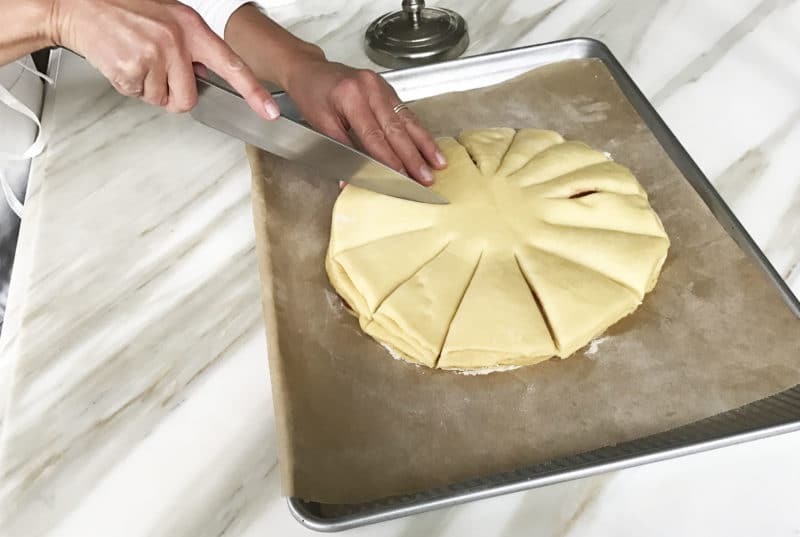 Transfer the circle gently on top of the jam-covered first circle and cover it with 1/4 cup of jam, leaving an inch around the edge dry. Repeat this with the third ball of dough. With the fourth, roll and place on top of the stack without any preserves; this is the top of of the brioche star. Place the whole sheet pan in the refrigerator to chill for about 20 minutes before cutting and shaping the star. Using a 3 to 4-inch round cookie-cutter (or the rim of a glass turned upside down), make a delicate imprint in the center of the top circle. Using a sharp knife, make imprints to guide where the cuts around the circle will be. Divide the circle into 16 even sections up to the center circle imprint. Start with 4 sections, then divide each of those into 4 sections. Slice 16 even cuts all around the outer edge of the center circle. If needed, slide the parchment paper back onto a board to make it easier to cut. Pick-up 2 strips at a time and twist them outwards from each other twice. Press the edges together and repeat until you have a lovely star! You can adjust the points of the star to be sure everything is even. 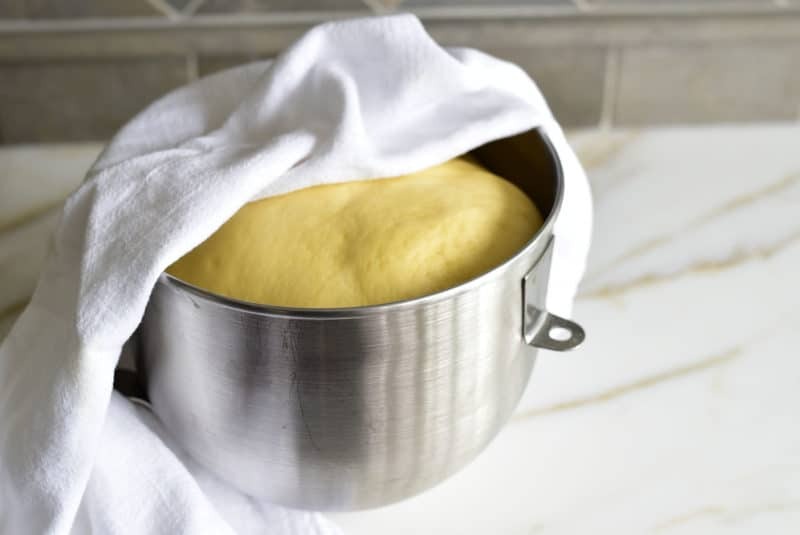 Cover the brioche with a clean towel and place in a warm spot to rise for 90 minutes. Whisk the egg and milk together. Brush the brioche with a light layer of egg wash.
Bake the brioche for about 30 minutes or until the top is golden. Dust with confectioner's sugar, and serve warm. 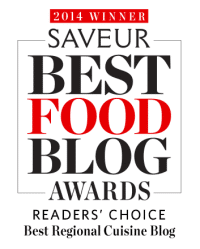 5 Responses to "Brioche Star with Strawberry Rose Jam"
Oh my gosh Louanne, thank you! Those look like it! It would be easy to substitute homemade dough too. Email me your address (maureen@maureenabood.com)!!! You’re getting a prize! The problem with Rhodes rolls is that they contain high fructose corn syrup. Better to make your own, but the recipe sounded yummy. This is a real show-stopper of a bread… I made one like this (a little smaller, judging by the last picture), mine had a chocolate filling, but I think yours is beyond perfect with your choice of jam and the powdered sugar on top. 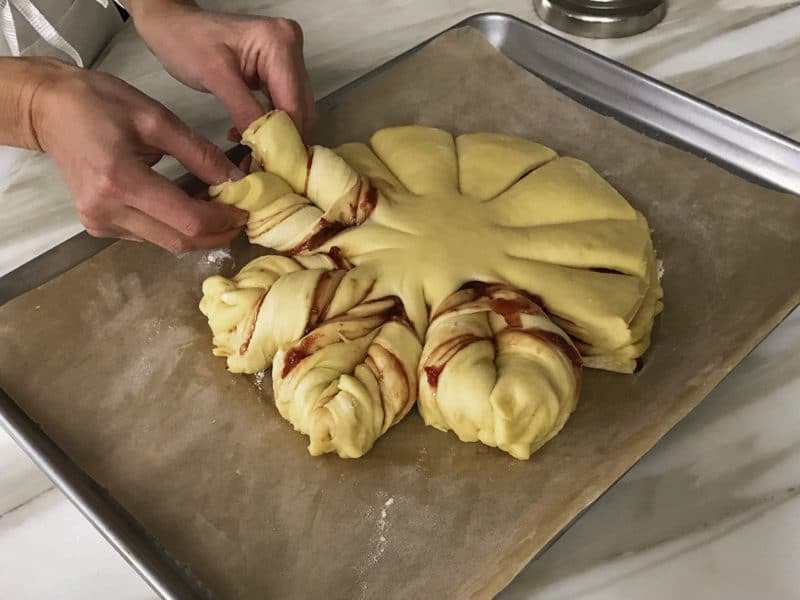 what I love about this bread is that it looks incredibly complicated, but it’s actually – as you showed so well in the pictures – not that hard to shape. Sally, those ideas sound so very good! Savory, mmmm. With za’atar!